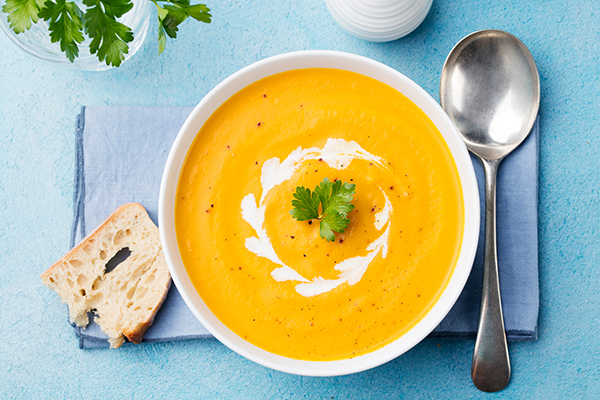 Warm up this winter with our delicious Simple Pumpkin Soup! Find our Recipe page under 2 Step Plan in the menu. Dice the onions and mince the garlic. Add 1/2 tablespoon of the Ginger oil and stir to ensure all onion has Ginger oil coating. Cut the pumpkin and add the remaining Ginger oil and stir to coat. Place the onions and garlic into a large pot over a medium heat and cook until soft. When soft add the pumpkin and the stock. Increase the heat and bring to the boil. Reduce heat and simmer for 20 minutes or until the pumpkin is soft. Blend the soup until smooth. Season with salt and pepper to taste.Serve with a swirl of pouring cream. This soup can have herbs and spices added to your liking. This recipe makes enough soup to serve eight and can be frozen.